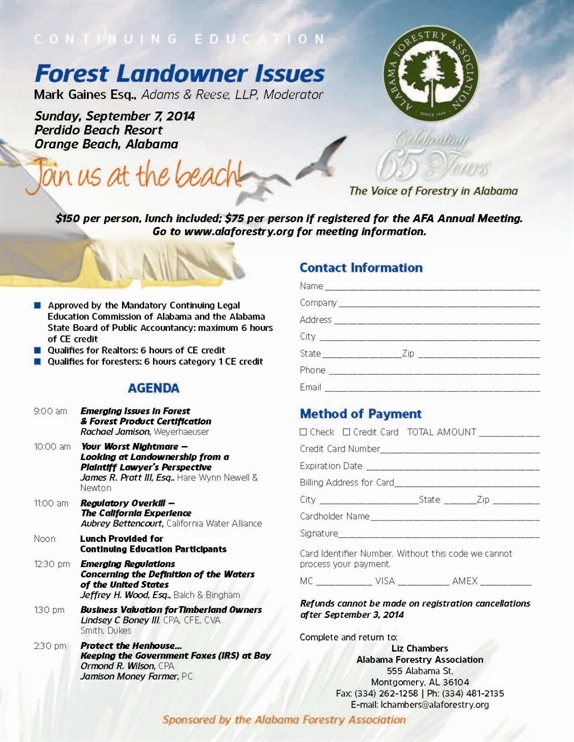 The Alabama Forestry Association’s 2014 Annual Meeting will be held September 7-9th at the Perdido Beach Resort in Orange Beach, Alabama. The theme for this year’s conference is The State of Government. Monday’s conference track will focus on the State of the Union while Tuesday will focus on the State of the State. Headlining Monday’s agenda will be a keynote presentation by Attorney General Luther Strange. He will then moderate a panel of key national corporate leaders as they provide insight as to the current national political atmosphere and its impact generally on the economy and specifically with respect to timberland ownership and forest product manufacturing. Luther Strange, in his tenure as Alabama’s Attorney General, has been at the forefront challenging the overreaching actions of the federal government. Testifying before Congress and filing legal challenges with respect to EPA emissions standards, arguing a First Amendment case before the U.S. Supreme Court or fighting the executive branch’s expansion of the Affordable Health Care Act are all examples indicating that the state’s attorney generals are the last line of defense for a growing federal bureaucracy. Alabama has joined with other states to challenge the federal government and Strange has been a leader in this movement. Sign up for the Annual Meeting at www.alaforestry.org, you will not want to miss the fascinating lineup of speakers, continuing education and just plain old fun! If you want to learn more about the conference click here. If you just want to look at the brochure for the Continuing Education Track click here and to register for Continuing Education click here. Buckle Your Chinstrap- Not only is Football Coming- But so is the 2014 Sunburn Classic! Time to get the clubs out and get the rust out of the ole swing! The 2014 Sunburn Classic is just a scant 48 days away. Our goal is to have 25 teams participating this year and we need your assistance to get the teams signed up. This year’s challenge is to topple last year’s winner Scotch Plywood (Ben Stimpson, Virginia Macpherson, Tony Sheffield and Hudson Williams). This team blew away the field with a low net score of 59.1. Once again we will offer two hole-in-one opportunities. The first is for a $133,000 2015 Kenworth T880 Tractor Rig provided by Trey Holladay of Truckworx in Birmingham. The second is for a $40,000 Nissan Titan pickup provided by Jack Terry of Jack Ingram Motors in Montgomery. Thanks so much to both of these companies for their support of the Classic. The 3rd Annual Sunburn Classic is held in conjunction with the Alabama Forestry Association’s Annual Meeting to be held from September 7-9, 2014 at the beautiful Perdido Beach Resort in Orange Beach, Alabama. If you have not already registered for the conference you can easily do so at www.alaforestry.org. The Classic will be held Monday afternoon, September 8th with a 1:00 pm shotgun start Entrance fees are $1,000 per four-man team; with a box lunch, drinks on the course and a great lineup of prizes included. The award ceremony will immediately follow the tournament- always a source of great entertainment (no pictures allowed!). Click on the brochure below to register online. ForestPAC, the political action committee for the Alabama Forestry Association, endorsed six candidates in the primary election run-offs that concluded yesterday. Of the six endorsed candidates, five were winners. In the Alabama Senate, Tim Melson (SD1), Shay Shelnutt (SD17) and Clyde Chambliss (SD30) all won their run-off races. Melson now faces Democrat Mike Curtis and Chambliss faces Independent candidate Bryan Morgan in the general election. Shelnutt has no further opposition and will be the next senator from the north Jefferson/Blount counties area (replaces former Senator Scott Beason). In the Alabama House, Arnold Mooney (HD43) prevailed in the run-off and does not have an opponent in the general election. In the Alabama Public Service Commission Place 2 race, Chip Beeker (AFA member) will now join the three member panel overseeing utility rates in the state. Unfortunately, in the Alabama House, Mac Buttram (HD12) was defeated by AEA backed Corey Harbison to represent the Cullman area. Harbison has no general election opponent, so he is the next representative for that district. Buttram distinguished himself over the last four years as one of the most conservative members of the Alabama House. A retired minister, Mac brought integrity and competency to Montgomery and his loss will be a loss for the entire state. On December 10, 2013, the Monroe County Commission approved a resolution authorizing the county to purchase a 7 mile strip of abandoned railway property from Pioneer Railcorp. The property, which is more than 80 acres, was appraised for $142,000 and the purchase price was $89,000. The Monroeville/Monroe Economic Development Authority secured a grant from the Alabama Department of Economic and Community Affairs for 80% of the purchase price and the remainder was provided by a private trust contribution. At the meeting, Glen Haab, MMEDA’s Executive Director said a recreational trail will be built on the property. On April 8, 2014, the Commission indicated that it was applying for an additional $500,000 grant from ADECA to continue work on the project that was characterized as a “biking/walking” trail along the abandoned railroad in the Tunnel Springs community. Probate Judge (and presiding officer of the Commission) Greg Norris said the county would be required to provide a 20% match ($100,000) and the matching funds would come from “private funds.” The funds would be used to construct an asphalt trail along the right of way. The trail will reach the mouth of the railroad tunnel, but not enter the tunnel at this time. When complete, the project will continue through the tunnel and on to Beatrice. Unfortunately, these “numerous fields, forest lands and streams” are not part of the project footprint. In fact they are owned by private landowners that are not enthusiastic about having their property invaded by the public. On July 3, 2014, the Monroe Journal reports that Judge Norris called a press conference to announce that the Commission has been awarded a $400,000 grant to complete the first phase of a walking/biking trail at Tunnel Springs. The grant requires a 20% match of $80,000 through the Federal Transportation Alternatives Program (TAP Grant). Norris stated that private funds, not taxpayer money, will cover the $80,000 match. The Alabama Trails Commission was established by Act 2010-585 during the 2010 Regular Session of the Alabama Legislature. HB376 was sponsored by then Representative (now Senator) Cam Ward and directs that the Commission be established within ADECA. The Recreational Trails Program (RTP) is funded by the U.S. Department of Transportation and provides funding assistance to federal agencies, states and local governments for the development and improvement of recreational areas such as walking, jogging, cycling, skating, backpacking, horseback riding and off-highway vehicle trails. The “Rails to Trails” program has not been without controversy. In March, 2014, the Wall Street Journal reported that the United States Supreme Court sided with landowners in Wyoming. During America’s westward expansion in the 19th century, Congress gave public land to private railroads to spur development of a transcontinental transportation network. In 1996, a railroad in Wyoming became abandoned and tore out the tracks. The U.S. Forest Service then sought to use the rights of way- which passed through a national forest and 31 parcels of private land- for public trails. All but one property owner acquiesced to the plan; Marvin Brandt, whose 83 acre property was the largest, and one associated with his family since his father began working at a local sawmill in 1939. The government argued that when the railroad ended operations, some property rights reverted to the government, like using the right of way for a trail. The Court, relying on a 1942 case, rejected the government’s argument stating that Congress only granted the right of easement and nothing more. The Justice Department is now defending more than 90 lawsuits challenging Rails-to-Trails projects involving 10,000 properties in 30 states, amounting to aggregate claims in the hundreds of millions of dollars. The Monroe County project is different in that the railroad held a “fee simple” ownership of the property as opposed to an easement. Therefore, it appears that the railroad has the right to transfer its ownership interest to the county (note: this issue is still not completely determined at this time). First, is the proposed trail limited to the 7 mile purchase from Tunnel Springs to Beatrice? Second, where will the $80,000 match, supposedly from private sources, come from? Third, what is the total project cost for the 7 mile stretch? According to the Monroe Journal report, the grant appears to fund only “Phase One” which extends from the Tunnel Springs community to the mouth of the historic tunnel. Where will the additional funds come from that will be needed to address the other “phases” of the project? Fourth, what is the County going to do to address issues that adjacent property owners have with the project. By its own admission, the County intends for this project to provide unique access to “numerous fields, forest lands and streams and is geared to draw outdoor recreational enthusiasts.” Heretofore, this has been private property. Does the county expect that this project will somehow not interfere with these landowners right to quiet enjoyment of their property? Stay tuned….we will continue to monitor events in Monroe County. Not only does this issue affect our landowner members in this particular instance but also because the Rails-to-Trails program could have similar impact in other parts of the State.